As an artist, it is always a good experience to see one’s work put together as a show. It seems to give one a clarity that one cannot have moving from one painting to another and from one experience to another. Seeing it as a unit clarifies the various experiences and brings them into focus. The vision of the artist becomes revealed. All that I felt I was on to in those moments takes on new meaning for me. Those intuitions and insights I had in those intimate spaces has acquired a language that speaks back to me and tells me who I am, for it is impossible to know oneself completely, and to find there something new. I paint not only to share my experiences with others, but to understand that compass within myself. Many times, one does not know why one is attracted to a certain image, but over time, those images expose a cartographer’s map, whose analysis of the peaks and valleys reveals a profound and beautiful imaginative landscape. It is why we love to see the body of an artist’s work, not just one or two images. It is this feeling for image, whether I encounter it in a painting or a poem, that is forever enticing me to seek its meaning and manifestation. The waterfalls are one of those images. William Blake states that, “Art is the incorporation of the greatest possible imaginative effort in the clearest and most accurate form.” This is the real challenge for the artist. Has my work achieved a unity between my imaginative perception and the form I have given to the image? Does the image have a vital life? 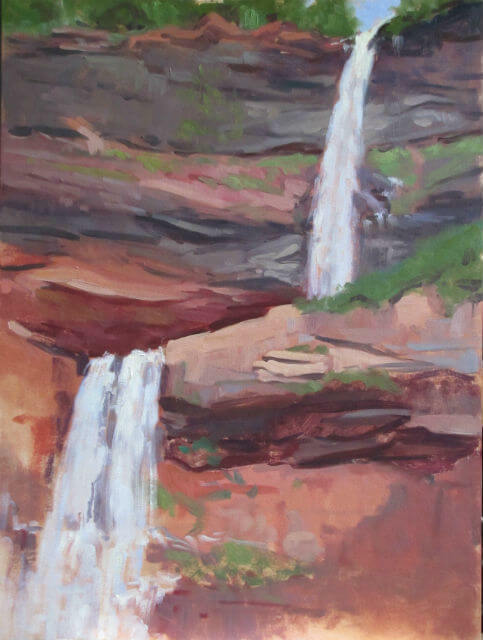 See “Waterfalls of the Catskills” on display at Saatchi Art.